Wow I have an awesome shop to show you! I had seen the lingerie floating around on Tumblr and had fallen absolutely in love. I contacted the owner, April, and she was kind enough to send me something to review so I could share it with all of you! Her Etsy shop is Bones Lingerie. Bones Lingerie is out of Los Angeles and April has been sewing for 5 years. She started up Bones Lingerie because she was obsessed with pin up girls and skulls and wanted to make lingerie that was beautiful and comfortable! She does accept custom orders/ requests and everything is made to order so please give up to 4 weeks before delivery! She gave me the option to choose what I wanted but I simply couldn't, so I gave her a few options of my favourites and she chose this one! This particular set is called Watercolour Purple and Grey Bats. It's currently not on her Etsy shop but she has many more that are absolutely perfect. 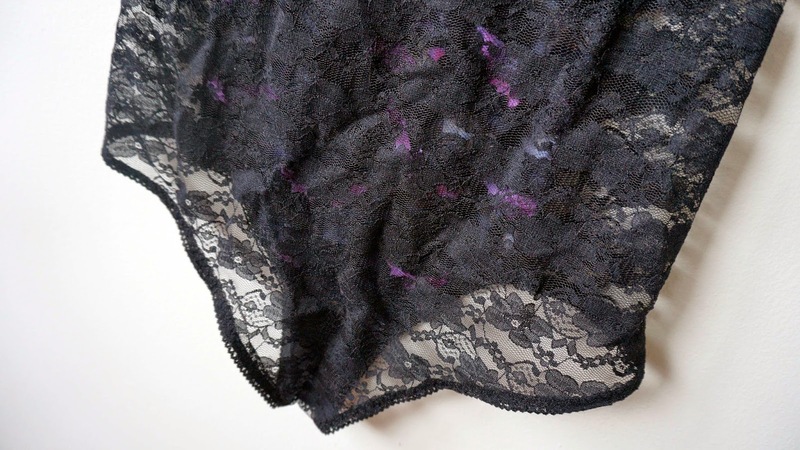 The bottoms are high waisted with delicate black lace for the back and purple and grey water colour bats on the front. At first I was very unsure about the fit and was convinced that they wouldn't fit me until I actually put them on and they fit like an absolute dream! I purchased them in an XS. Here's a up close photo of the back of the bottoms. It's see through which I personally think is so adorable. Just sheer enough for a little tease. For the top she used the same water colour purple and grey bats. The top is not padded which is why I did purchase it in the size 32C. I wanted to be able to wear this on top of my bras so I could wear it in the summer as a crop top and still feel comfortable with the way I looked. The top is very comfortable and none of the material is itchy or bothersome. The top has an adjustable band, and it also has adjustable straps for the perfect fit. 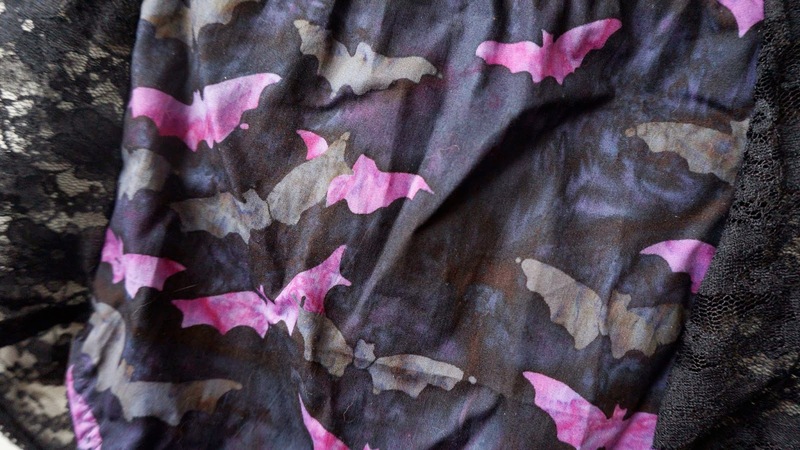 A close up of the water colour bats. I absolutely adore Bones Lingerie and feel addicted with only one piece from the collection! Please feel free to check them out, you won't regret it! Here are some links so that you can further check Bones Lingerie out!